Our inner fire continues to burn. Mni Wiconi - Water is Life! In this final hour before the February 22nd eviction date we are asking you to support us with a Global request for an extension of that deadline. We believe that this is an unrealistic timeline which can only result in forcible removal of Water Protectors and our sacred and personal belongs. We are in full cooperation with The Army Corp of Engineers and are committed to a good faith combined effort to clean up the land. We want good relations with ACOE and believe that all parties can be honored for a positive outcome. I ask you to contact the ACOE to make this request in a respectful way that will continue to feed the positive efforts that are being made on the ground by all parties. Women call for standing for the water on treaty territory. 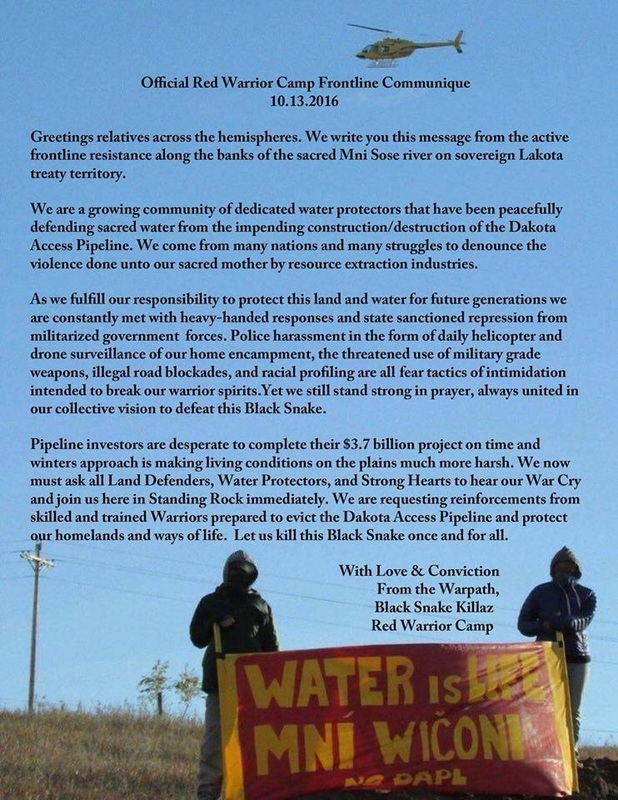 Come stand and support the water protectors! Historical note: cleanup was going well before water protectors were forced out. Executive memo to proceed with DAPL. Now, 2/7/17, USACE grants permit for DAPL to cross Lake Oahe. Donate to camp cleanup and migration out of the floodplain from the Water Protector Camp page. Go to January Daily (and now February Daily) pages for people's responses from the camps, and solidarity events for local support actions. ​2pm 2/22/17 is final deadline. "All person residing in the area shall immediately begin efforts to remove their personal property and possessions from the evacuation area." All those in process of removing their property and possessions shall be allowed to return to the area through 2/21/17 to complete the evacuation process. ​Archivist Note: This is still treaty territory. In a floodzone, yes, and the snow is melting, AND, who has jurisdiction? Other than unrecognized treaty jurisdiction, it may be that the USACE has jurisdiction and would have to request help from the state if they wanted to force an eviction (via Chase IronEyes). Mainly, cleanup needs to happen, and fast, with cooperation from all sides. Go to our EIS Comments Page to guide you to resources that may help you with this (construction in process). 1/17/17: NOTICE OF INTENT for conducting an Environmental Impact Statement on the Dakota Access Pipeline crossing the Missouri River was filed on January 17th, 2017! Also a request has been made to stop non-violent direct actions at camps to allow this process to go through. Meanwhile, the 1806 bridge blockade is still closing off an important public road for no good reason, there is a large force of police intimidating people camped on treaty land in the area, and a new administration is about to start doing whatever they are going to do. People are cleaning up the floodplain camp and moving to higher ground, some to more permanent eco-villages in Standing Rock (Sacred Stone camp and one possibly starting near Cannonball - see buildwithstandingrock.org ). Water protectors are working around the country to help us move towards a sustainable future. The establishment of the Oceti Sakowin Camp was done with ceremony. When we talk about returning to tradition and bringing forth the old ways, the process was always collective. Individuals did not decide what was best for the Community. The respected Chiefs and Elders decided what was best for the people. The fire has been put to sleep. Tribal Council says it is time to go home. The Elders have said it is time to go home. The Communities around here have said it is time to go home. We cannot rage against every enemy we are up against, or we are going to get chewed up. We need allies, and Tribal Council is one of them. It has never been about individuals with the Lakota people. When Elders decided to move and individuals stayed behind, they knew they risked death. Survival is in the group. The Lakota never would have stayed in one place for 6 months. We would have used all the resources and left a footprint. In order to be here today we always have to look to the past. They can’t kill us. Thy tried genocide in so many ways, and they can’t kill us… and this is why. We are just scratching the surface of what it means to live in the North Dakota Winter. The Elders who lived here were tough. Child mortality was ten times what it is today. It is time to go home. THERE ARE OVER 1500 people still there between the new Oceti Oyate (The Peoples Camp, formerly Oceti Sakowin) Camp, Sacred Stone Camp, Rosebud Camp, MEDIC AND HEALER CAMP IS STILL HELPING PEOPLE. THE HIGHWAY IS STILL BARRICADED. There are still close to 500 vets there fluxing in and out as the entire vet plan always entailed. THERE WILL BE PROTECTORS THERE UNTIL DAPL IS OUT. Period. Red Warrior (Society) Camp is one of the front line camps that was in a flood zone. It was NEEDED at the time where it was, it can no longer remain there due to safety. Upon disbanding, moving and reforming they have sent people all across the nation to SABAL, BAKKAN etc..( read all the way to the bottom to learn about the 44). If you're confused by David separating the Tribe .. he has to do that LEGALLY. They have released any LEGAL responsibility to those that stay. It is for Legal purposes . The tribe can't be held responsible for people who freeze to death from being unprepared. It is no different than Morton Co. and Army Corp all releasing liability to people. Essentially if you go be 100% prepared. It is Blizzard Conditions. The plains get up to a -60 Wind Chill . ​Sacred Stone and Rosebud and other camps are still open to new arrivals provided that the people coming are self-sufficient and provide support through work to the camp including builders, carpenters, masonry, welding, laborers, healers, nurses, doctors, attorneys, legal support staff, IT professionals who can help with communications, and other essential duties. IMPORTANT REMINDER MESSAGE, PLEASE SHARE: 4015-WARMTH (401-592-7684) - the number to TEXT message if you're interested in getting supplies from the Medic and Healer Council storage units and/or are willing to volunteer in the donation distribution efforts. People should include the below info in their texts so progress can be made in getting useful supplies to people who need them. Name Contact number Camp Access to 4 wheel drive vehicle? Willing to Volunteer? Also please let anyone you know directly at any of the campt that needs supplies to text details to this number. Also, be sure to include details of how long you can stay and how much work your'e willing to do at the warehouses. ​This archive is an attempt to gather as much valuable information as possible from the ever-scrolling timelines of facebook (and elsewhere) that has been pouring out from North Dakota's Standing Rock Water Protector camps. There is great wisdom being shared by people taking a stand for a sustainable future for the generations to come. Subjects are organized so that links from facebook, and elsewhere, can be easily found. We hope you find it useful. May I recommend the interviews page as a place to start? Listen to the words of the people and see for yourself. 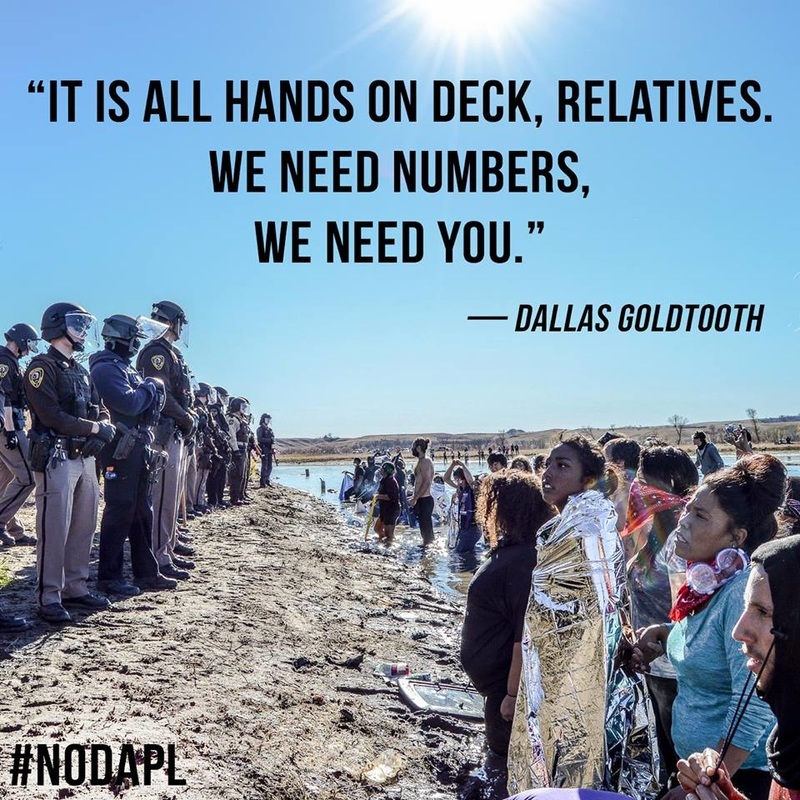 Go to our CALL TO ACTION page to see what you can do to help, either from home or by traveling to Standing Rock. Scroll down to for a summary, how to support, a list of camp websites and contacts, and a way to contact nodaplarchive administration. ​#NoDAPL is a hashtag for the struggle against the proposed and partially built Dakota Access Pipeline. ​More than that, it is a struggle for clean water and sustainability. It is a struggle to leave a planet in good shape for the generations to come. It is also a struggle for the sovereignty and treaty rights of the First Nations. People in Standing Rock as well as about 18 million people get their drinking water from the Missouri River, downstream from the proposed crossing. ​Kids and teens from Standing Rock took action and ran 2000 miles to ask the US Army Corps of Engineers and then President Obama to prevent approval of this proposed pipeline. The response was.... silence. The lawsuit for a preliminary injunction to stop the pipeline from going under the Missouri was not going to be responded to until September 9th. 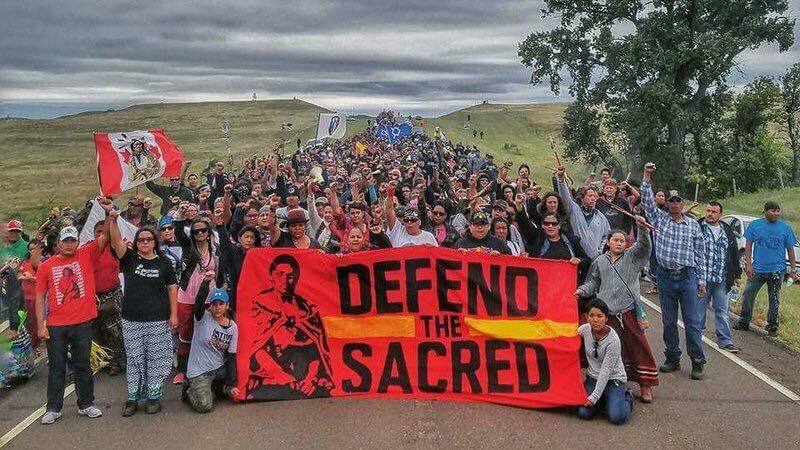 August 10th, 2016, construction was attempted on the west side of the Missouri River, on Standing Rock treaty lands, and water protectors stood in the way.... then thousands of people came to help. This site is an attempt to keep a record of this powerful, historic, indigenous-led movement. Water protectors and families should contact the Water Protector Legal Collective/NLG (or go to their website at http://waterprotectorlegal.org/ ) for information on charges, bail, and legal status of relatives. Please keep in mind that they are working hard to keep track of hundreds of people. Contact them at redowllegal@gmail.com .